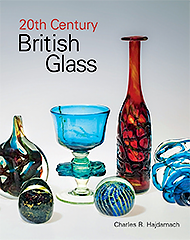 This is the most comprehensive book yet published on twentieth century British glass with hitherto unpublished catalogues, contemporary photographs and hundred of objects grouped to assist collectors with identification. The majority of the items, from private and public collections, are illustrated for the first time. The book covers everything from Art Nouveau and Art Deco masterpieces to the now much ignored Pyrex ovenware and everything in between from engraving, cameo glass and paperweights. The chapters focus on the effects of the two world wars, special features look at individual designers including Keith Murray, while major exhibitions including the Festival of Britain in 1951 are fully discussed. Biographical sections look at post-war designers including Geoffrey Baxter, Ronald Stennett-Willson and Frank Thrower. During the nineteenth century major European glassmaking centres exerted strong influences on British glassmakers. The reaction of Bohemian glassmakers to Regency cut glass led to the development of coloured glassware which was immediately copied in turn by English glassmakers and exhibited in all its glory at the Crystal Palace Exhibition of 1851. In the second half of the century the great glassmaking tradition of Venice influenced important glassmakers of the calibre of Apsley Pellatt, John Northwood and Harry Powell. The prosperity of Victorian England attracted Bohemian engravers, French enamellers and gilders who played a vital role in establishing this period of manufacture as the Golden Age of glassmaking. 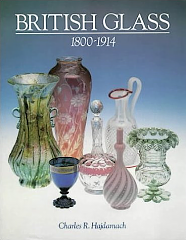 This major publication has established itself as the standard work on nineteenth century British glass. In addition to cut, engraved, cameo and etched glass, the information on personalities, working conditions and the operations of the glasshouse gives the collector an all-round view of the subject not available elsewhere in one publication. It offers an insight into the great Stourbridge factories which dominated the nineteenth century glassmaking scene, complementing the glass with contemporary archive material, much of which facilitates the dating of pieces. Fifty stunning colour plates of groups of glasses arranged by type and over four hundred black and white illustrations complete what First Sunday referred to as the most comprehensive study yet of the greatest period in the history of British glass.